The magical Marlborough Sounds and pristine Abel Tasman, New Zealand. Yesterday (Dec 11, 2006) we travelled from our heavenly location of Titirangi Bay to Nelson for a bit of housekeeping. Even on the road it has to be done!! Once we had the housekeeping out of the way, we grabbed a bite to eat on the way out of Nelson and headed straight for the town of Marahau on the outskirts of the Abel Tasman National Park - the smallest and busiest of all the national parks in New Zealand. December 12, 2006: This area is known as the sunniest place in New Zealand and it does not fail us as we rise to yet another bright and sunny day. After checking out some kayaking companies and booking an excursion for tomorrow, we head for "lands end" Farewell Spit! 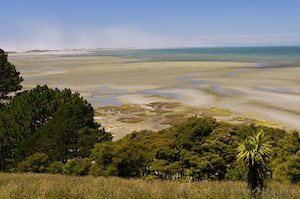 The sandy spit, which is the longest in New Zealand extends out from Fossil Point which is situated 1.6km from Puponga, for 35km across the entrance to Golden Bay. The spit is created entirely of sand which has derived from the erosion of granites, schists, and other rocks on the West Coast. This sand is carried northwards by coastal currents, dumping it in an arc which is gradually filling Golden Bay. Farewell Spit is one of New Zealand's most important wading-bird habitats, the most numerous being the Godwit and Knot. Although both Cape Farewell and Farewell Spit were first noted by Abel Tasman, Captain Cook named them both when he left from New Zealand in 1770. We continue our exploration by driving to the road end for a walk to Wharariki Beach, known as one of the most stunning and diverse beaches in New Zealand. With the winds gusting to "I don't know what" but enough to nearly blow us of the track. The track itself crosses over farmland with grazing sheep and through coastal scrubland before opening up to large sanddunes. Unfortunately, because of the high the high winds, we were sand blasted as soon as we got to the clearings, so did not stay long. Beautiful beach though and nice walk!! By this time the day was drawing to a close and we had to head back to Marahau and get ready for an earlyish start tomorrow.